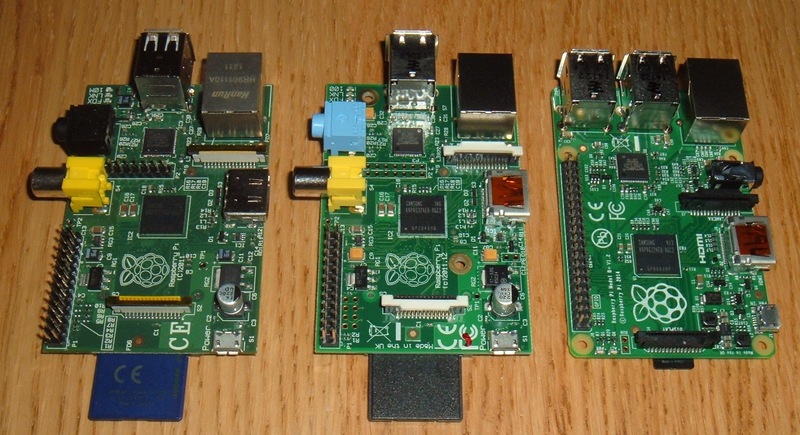 Dear Raspberry Pi Foundation, thank you for making my life a little easier. 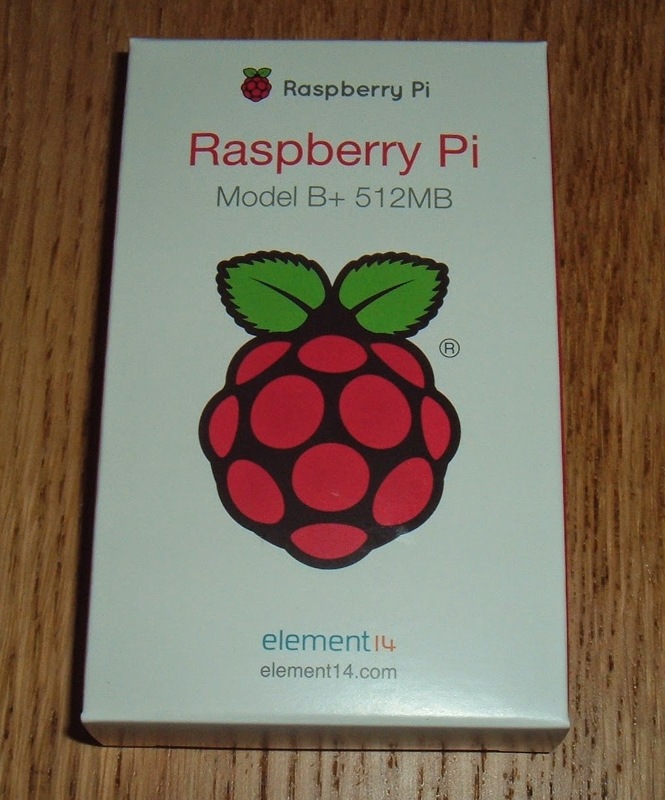 The new release of the Raspberry Pi, the Model B+, has a number of improvements over the previous Model B, which should make life easier for those integrating the Pi, as I do with my USB Keyboards. So what's inside the box? 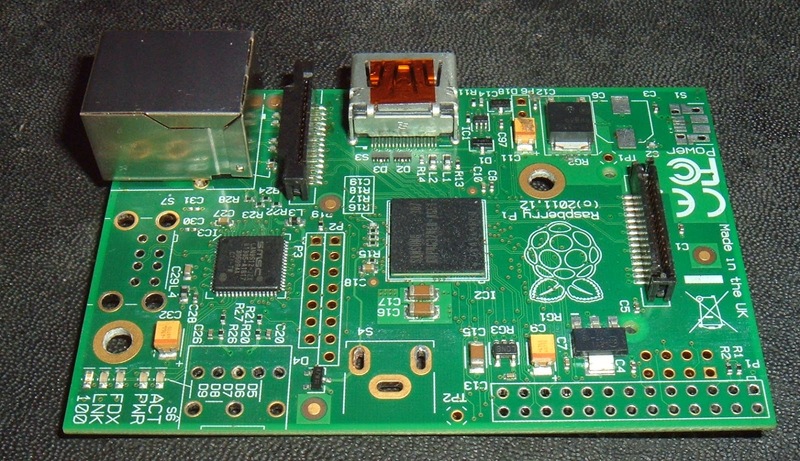 Well, a slightly smaller Pi. The main connectors are now on just two sides, rather than all four sides as it used to be. 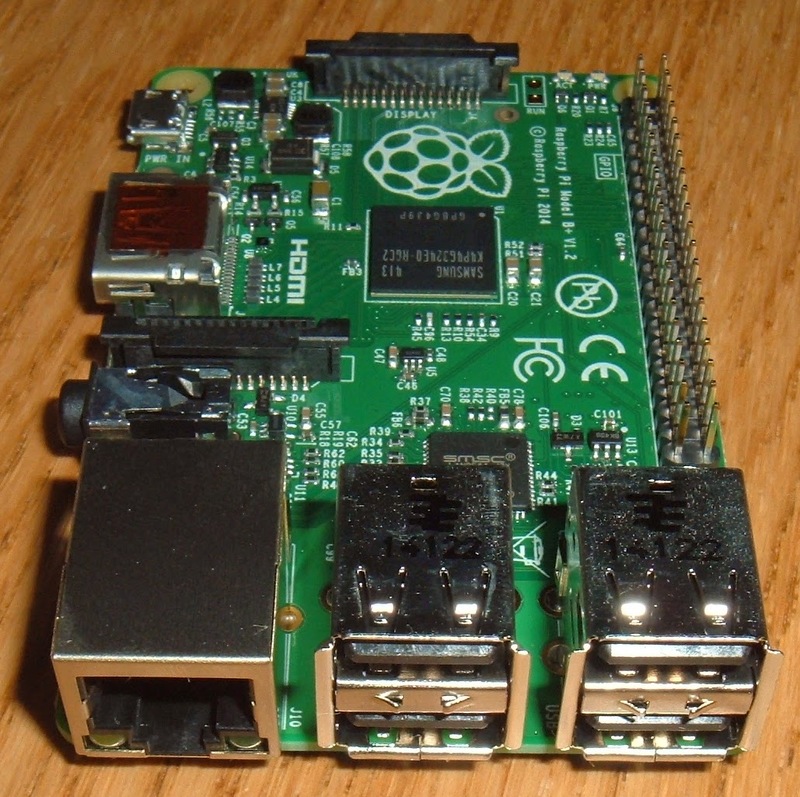 The USB jacks are now inline with the edge of the board, and there are now two of them, giving 4 USB ports. Theese ports are also now inline with the RJ45 magjack for the LAN. The network activity indicators are now built in, and the power and disk activity now moved to the other edge. 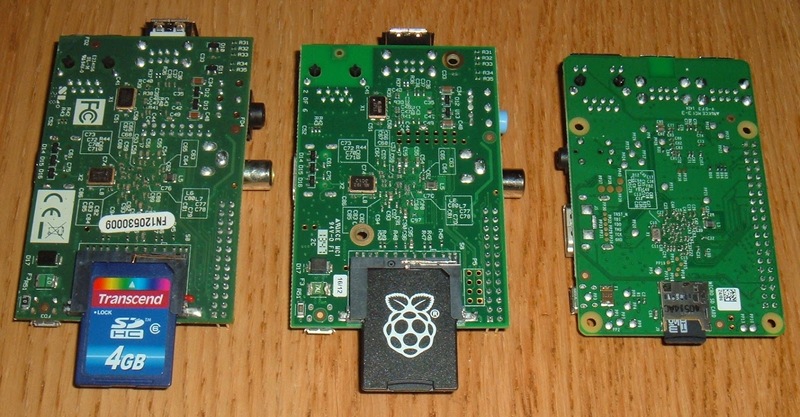 You can see the evolution from the original release of the Pi on the left, through the first revision which had two mounting holes added, to the new board, with four mounting holes at the corners. There are also more pins on the GPIO, it's now 40 pin, so time to dig out all those IDE cables which were also 40 pin. The audio has been improved, and the audio and composite video have been combined into a single 4 pole 3.5mm jack. Power consumption should also be improved by use of switch mode regulators rather than linear as in the previous models. On the back, the SD card has been replaced with a micro SD socket. Again, this overhangs less than the previous SD card slot, and should be more reliable. All these changes of course mean it will no longer fit in most of the current cases. They say old model B will remain on sale, probably until all the case manufacturers have sold their remaining stock of old style cases. 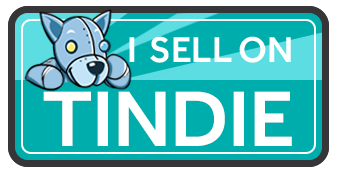 Look out for some offers soon. 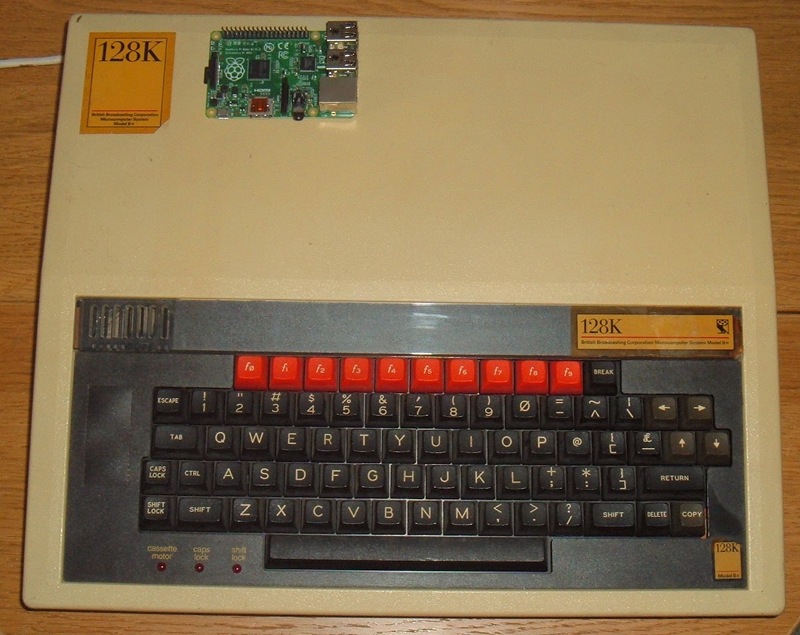 Here it is with its the namesake, the BBC Model B+, the last revision of the BBC Micro in the original case (the next was the wider BBC Master). 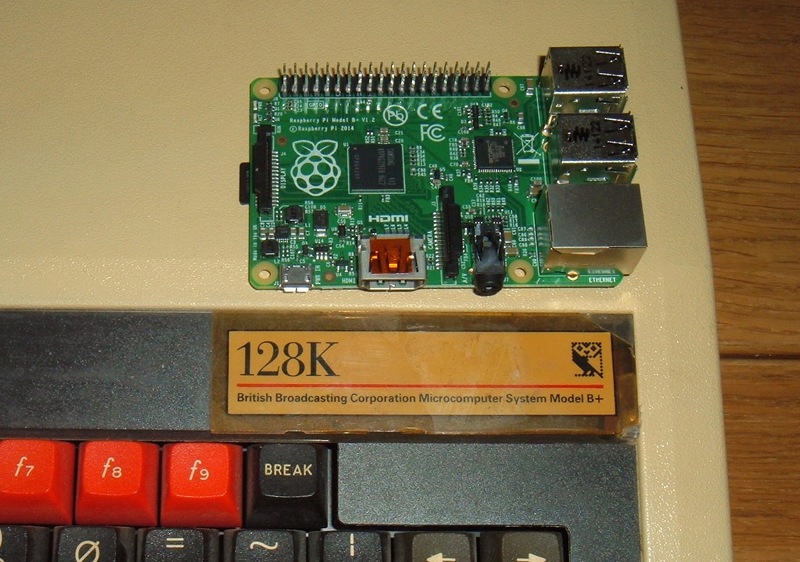 30 years later, this new B+ is 512MB, only 4000 times more memory than the B+ 128K. 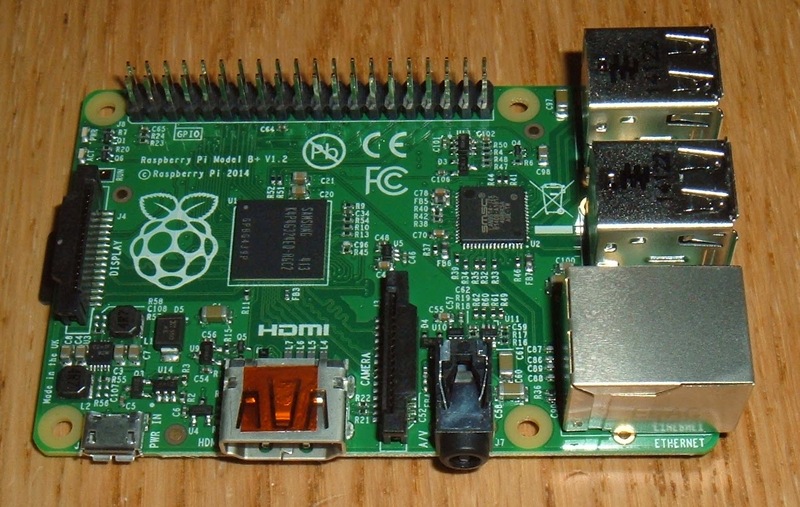 I'll be using one of these in the next casemod (the Pi, not the BBC), so it will be interesting to see how much better it fairs. In previous builds, it has sometimes been necessary to remove some or all of the connectors in order to fit it in the case, hopefully I'll not have to do that next time.